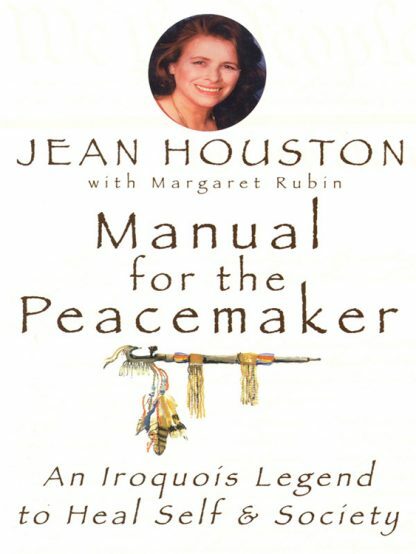 Red Wheel ∕ Weiser Online Bookstore | Manual for the Peacemaker: An Iroquois Legend to Heal Self and Society by Jean Houston, Ph.D.
A thrilling retelling by master storyteller Jean Houston of the legendary exploits of the founder of the Iroquois Confederacy, known as the Peacemaker. Under his leadership they created a peaceful democracy among five tribes of Native peoples in the northeastern woodlands. This story has inspired American leaders from Benjamin Franklin to the present-day occupants of the White House, and is shown by Houston to be a potent guide to personal transformation and to the visioning of a peaceful world. Jean draws from the experiential workshops she leads, with the help of Margaret (Peggy) Rubin, to guide readers through group or individual exercises that "bring the story home."